Today on the Doc on the Run podcast, we’re talking about how much stress reduction you need in your foot to heal while you continue to run. Let’s to talk about how much stress reduction you really need in your foot to heal while you continue to run. You have to think about this in a couple of ways. One of them is that you have to remember that the injury that you have, any over-training injury, is caused by too much stress applied to that one structure. 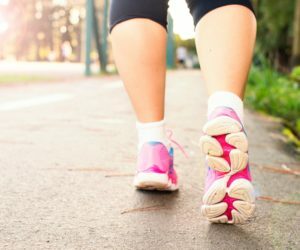 Once it starts to heal and you are trying to return to running, you have to keep the overall amount of stress applied to that one healing structure low enough that it can continue to heal even while you ramp up your activity. Remember, you are trying to heal that one injured part. You have one stress fracture, one plantar plate tear, you have one structure that has been damaged. Whatever your running injury is, you have got to heal that one structure, but you can do heal it if you can reduce the amount of stress to it, and you can still ramp up your activity. There are lots of different ways to remove pressure, and you have to think about doing this in a graduated fashion as you continue to heal. There is a whole continuum of healing all the way from doing absolutely no activity, where the bone is really weak, where the structure is really weak, where the ligament is really weak, and then it starts to heal and get stronger and stronger, and it can take more and more activity. A little more stress at each stage of that activity. So let’s talk just about the stages and ways that you can graduate that weight bearing and slowly increase the stress applied to the structure. The first stage, the lowest amount of stress applied to a structure of course is complete non-weight bearing. That means you are in a wheelchair, you are on bed rest, or you are on crutches. You are not putting your foot on the ground at all, that is the lowest amount of stress. The second stage is using a fracture walking boot. So usually when you get off of crutches, you are protected in a fracture walking boot. That fracture boot is holding you still, it’s immobilizing everything, and even as you walk, because of the curvature on the bottom of the boot, it doesn’t load the forefoot as much as when you are walking without the protection of the boot. In the third stage of weight bearing you can do something else. You can actually add a pad in your shoe that takes the pressure and moves it somewhere other than that one injured bone. So if you take a metatarsal pad and you modify it, and you put it underneath your insert in your shoe, and it applies pressure to the neighboring metatarsal bones and takes stress away from the one injured metatarsal bone that has a stress fracture, you reduce that stress even more. But of course, you are applying even more stress to those neighboring metatarsals, so it’s a lot more reduction of stress to the one injured bone, but it’s a lot of additional stress to the neighboring bones. Another way to modify your running shoe insert is to basically cut a hole in an insert in a running shoe, where you are only removing literally a couple of millimeters of material and thus just a tiny bit of pressure to that one injured metatarsal bone, or the one plantar plate sprain, or whatever has been injured in your foot. And if you take that one modified insert where you cut a hole in it, that is removing a little bit of the stress, but it’s not removing as much stress as, say, a big bulky pad that really moves that pressure aggressively to the other structures around that one injured part. Of course, the last thing is no modification of any insert at all. That is just your normal biomechanics pattern, right? Your normal foot strike, your normal biomechanics, applying the same amount of stress that you had when you got the injury. Somewhere along this stress reduction continuum is what’s right for you at every stage of the healing continuum as you progress throughout your recovery. So you have to remember, this is the trick with it: you are trying to remove enough pressure from that one injured part to heal that injured part, but not so much pressure that you damage some other part. That is why you want to do this in a graduated fashion. When a bone is at its weakest, you want to stabilize it and protect it the most with crutches or a fracture walking boot. As soon as you feel like the injury starts to heal, then you want to basically increase the amount of pressure applied to that bone and decrease some of the stress and the pressure that is put on the neighboring structures. So you are basically going to go, in most cases, from strict non-weight bearing, where you are using crutches, to graduated or protected weight bearing in a fracture walking boot, and then you go from there to modifying your insert by adding a pad that takes pressure specifically off of that one injured structure, but puts a lot of stress on the neighboring metatarsals. It’s okay to walk in an padded offloaded insert like that, but you don’t really want to run with it. It’s okay to cycle in it because that is non-impact, but you don’t want to just take a big pad, put it in your shoe to take all the pressure off that one injured structure and apply it to everything around that structure because it might be too much stress. You might end up with a different metatarsal stress fracture. 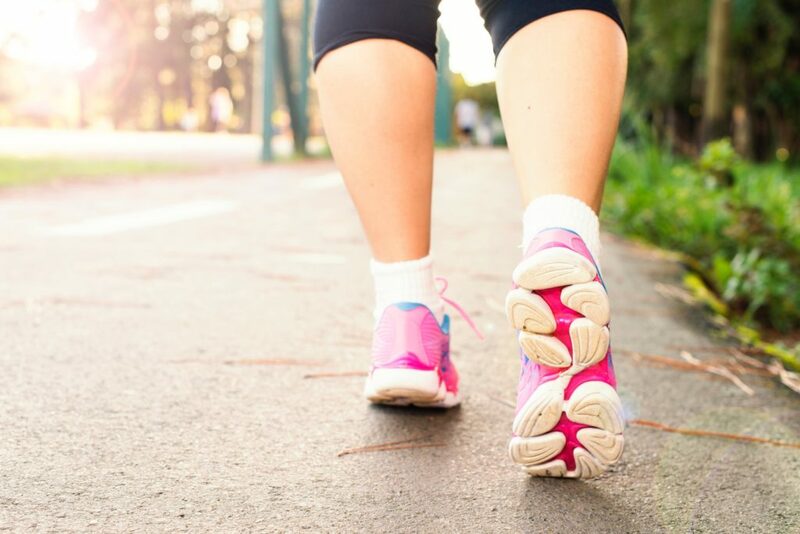 When you transition to running, you can remove the pad and then do something even simpler to remove the stress from that one structure, like modifying a shoe insert by just cutting a hole in it and putting that insert under the insert in your running shoe. And then, of course, when you are all healed and you are all better, you just remove all those modifications so you are back to your normal running. But you don’t want to do that until you are fully healed and you are really ready to run and train without restraint. Just remember, you have got to do it in a graduated fashion, but the goal is to actually increase the amount of stress applied to that healing structure right at the time the healing tissue is strong enough to take it. You just have to monitor it, you have to check it, you have to keep increasing the stress, but remember, you have to keep moving while you keep healing. 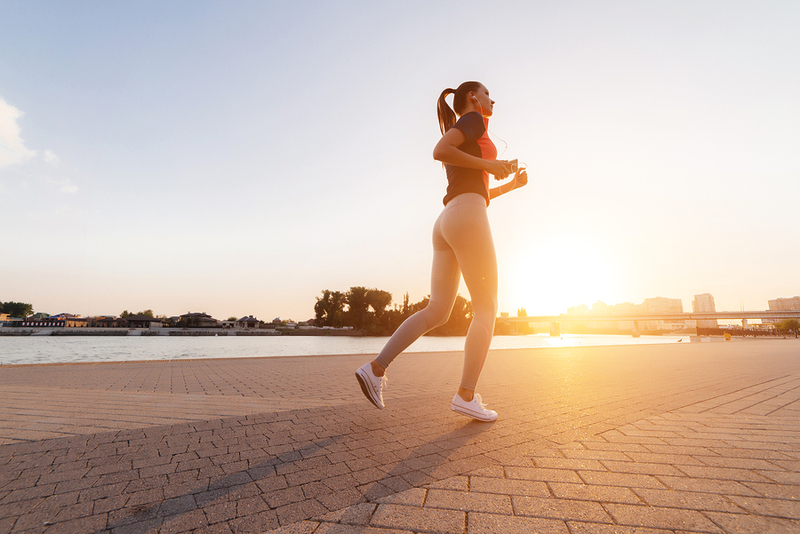 That is the key to getting back to running as quickly as possible. 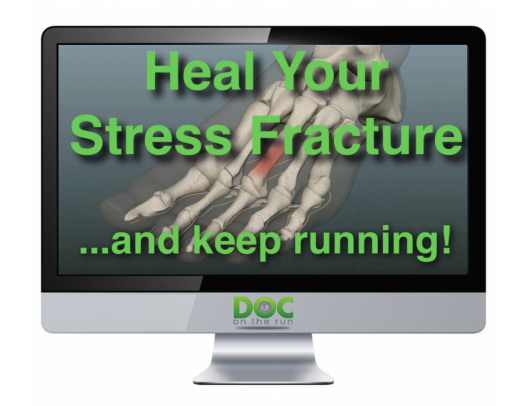 If you have stress fracture and you want to run, you need the Metatarsal Stress Fracture Course!